The New England Patriots won their sixth Super Bowl Sunday in a mostly drab, defensive game that they ran away with late, beating the Los Angeles Rams 13-3. In a game that featured a highly anticipated quarterback matchup between the already legendary Tom Brady and up-and-comer Jared Goff, it was the running game that settled it. The Patriots' Sony Michel punched in the game's only touchdown in the fourth quarter and the team's backfield earned a series of first downs on the following drive to put the game out of reach. It gives Tom Brady a sixth Super Bowl ring, a record. His Patriots are now tied with the Pittsburgh Steelers for the most wins by a franchise. "They made it tough on every play and we just kept fighting and finally got a touchdown. The defense played the best game of the year," Brady said in an on-field interview. Until Michel's tally, the Patriots had scored as many points as they'd turned over the ball, while the Rams struggled to move it at all until tying the game deep in the third quarter. 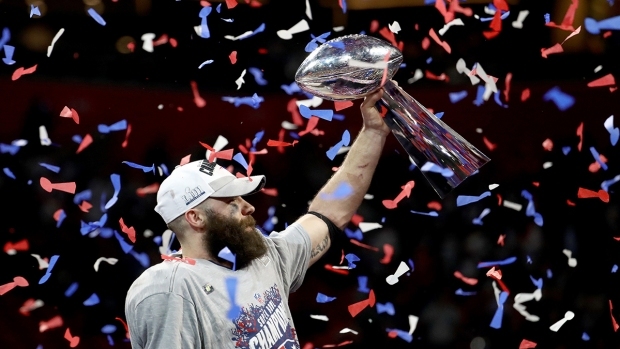 It was the lowest-scoring Super Bowl in the game's 53-year history. Julian Edelman caught 10 passes for 141 yards; he was the day's only consistent offensive threat and was named the game's MVP. Tom Brady's struggles, which included an early interception and his first sack of the postseason, were eclipsed by the Rams ineffectiveness — they tallied just 57 yards over the first two quarters and 260 overall, compared to 407 by the Patriots. The offenses were anemic enough that at a third-quarter punt from the Rams' Johnny Hekker — the longest in Super Bowl history at 65 yards — got the game's commentators excited. "That's the highlight of the game!" Tony Romo said as a Rams player danced over the still-rolling ball. The Rams won the coin toss and elected to kick but the Patriots couldn't capitalize on Cordarrelle Patterson's 38-yard return. Brady's first drive ended in an interception when Rams linebacker Cory Littleton pulled down a tipped pass. If experience was a factor in the game, the overwhelming edge was with the 2½-point favorites from Foxborough who entered the game 5-3 in Super Bowl matchups with Brady at quarterback and Bill Belichick in the hoodie on the sideline. But the Patriots' longtime kicker, Stephen Gostkowski, narrowly missed his first field goal attempt when the Patriots got the ball back. He didn't miss his second or third attempts, though, putting the Patriots up 3-0 in the second quarter from 42 yards and giving his team a two-possession lead with a 41-yard drive in the final two minutes. With a minute to go in the first half, Brady led his team to the Rams' 32-yard line but couldn't convert a fourth down pass to star tight end Rob Gronkowski, making for the team's third turnover. The Rams, meanwhile, punted on their first eight drives and didn't manage a third down conversion until more than halfway through the third quarter. It was the lowest score in a Super Bowl at halftime since Super Bowl 9, when the Pittsburgh Steelers led the Minnesota Vikings 2-0. With about two minutes left in the fourth, Greg Zuerlein tied the game with a 53-yard kick. But nowhere was the experience matchup more uneven than at QB. At 41, Brady was the oldest quarterback to start a Super Bowl. The Rams' Jared Goff was 24 and one of the youngest. And after the Patriots' touchdown, Goff was unable to finish his strongest drive, throwing an interception to cornerback Stephon Gilmore on the Patriots' 4-yard line. Gostkowski's second successful field goal all but sealed the win and was followed by a missed last-ditch field goal by the Rams' Zuerlein that settled it. Patriots coach Bill Belichick, at 66, became the oldest coach to win a Super Bowl. He had worked 41 postseason games, with 30 victories, most among head coaches in NFL history. He was the only head coach with five Super Bowl rings. His counterpart on the Rams, Sean McVay, is half his age and took part in his first NFL title game, the youngest Super Bowl head man. 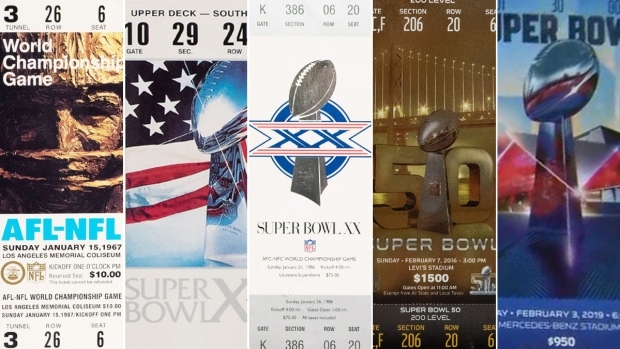 The Rams' past two Super Bowl trips were representing St. Louis in 2000 and '02, and only had four players who had gotten this far. New England had four on its defensive line alone.